With all the emphasis on misidentified photos of Elie Wiesel, the fake pictures drawn by Simon Wiesenthal are being ignored. Simon Wiesenthal was a Holocaust survivor, after whom the Simon Wiesenthal Center in Los Angeles, CA was named. I visited the Center several years ago and saw the original of this drawing by Simon Wiesenthal on display. 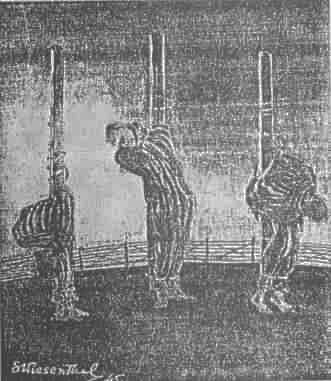 Drawing by Simon Wiesenthal shows three Mauthausen prisoners who were shot by the Nazis. ….Wiesenthal’s own personal Holocaust memoirs, entitled KZ Mauthausen, Bild und Wort (Concentration Camp Mauthausen – pictures and words) which was published in 1946, contains one of the most blatant forgeries of all Holocaust memoirs. Wiesenthal illustrated his book with drawings which he allegedly did either while in Mauthausen or from memory thereafter, and one of the more famous pictures from his book is of three Jews, in their striped prisoner outfits, who had been shot at the stake by the Nazis. Simon Wiesenthal, an Austrian Jew who was born in 1908, is perhaps the best known survivor of Mauthausen. He arrived at Mauthausen in February 1945, after being evacuated from Auschwitz-Birkenau in January 1945. Wiesenthal is one of the few Holocaust survivors who claimed that there were no gas chambers on German soil, although he later reversed this statement. Wiesenthal worked for the US War Crimes Office from 1945 to 1947 and founded the Jewish Documentation Center in Linz, Austria in 1947. He made his home in Vienna in 1961 and worked tirelessly in hunting down Nazi war criminals until his death. 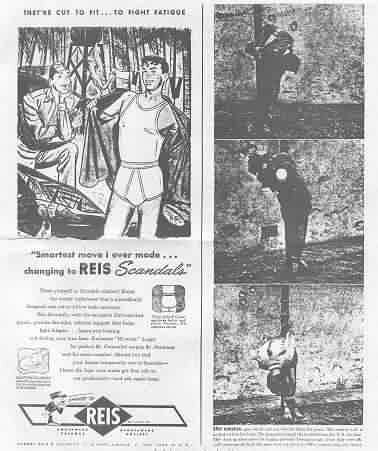 Although Wiesenthal alleged in his book that the drawing of the three shot Jews occurred in Mauthausen, the truth is that he plagiarized this picture from a series of photographs which appeared in the Life magazine of June 1945. The series of photographs were of German soldiers, captured during the ‘Battle of the Bulge” wearing American uniforms, and executed by firing squad as allowed by the Geneva Convention. Wiesenthal copied his picture of “three shot Jews” from a Life photo essay which showed three Germans being shot by Americans! On the day that I visited the Simon Wiesenthal Center, it was overrun by young students who couldn’t have cared less about the Holocaust. These students, from Southern California, were mostly Mexican-American. They had been brought to the Simon Wiesenthal Center for indoctrination. They had no clue that the famous drawing by Simon Wiesenthal, which was purported to be a depiction of the execution of Jewish prisoners at Mauthausen, was in fact a fake. A very large percentage of Jews will tell a lie when the truth would be much more convincing and easier to tell. Lying is apparently in their DNA. If in doubt, read the Old Testament, which contains hundreds of the most outlandish tales imaginable – all written and recorded by Jews, and sad to say accepted as truth by a large number of Gentiles. Simon Wiesenthal’s Forced march to Mauthausen was an incredibly miraculous feat. Lubomyr Prytulak’s point of view on Wiesenthal’s drawings is worth reading. Who remembers Johnny Cash “At Folsom Prison”?